Last week, at Microsoft’s Tech Summit in Amsterdam, I gave a talk about running Exchange Hybrid connections over the long term. In that session, I talked about securing a hybrid deployment and – somewhat related – how to best and securely publish migration endpoints to the Internet. Following that session, someone reached out to me asking me for more guidance on the topic. Except from what I have written about migration endpoints in the Office 365 for IT Pros e-book, I couldn’t find much else on the topic, so I figured I might elaborate on it a bit further. You can read more about it over on the blog of the ENow folks. This being said, additional information beyond what’s described in this article can be found in the Office 365 for IT Pros e-book, which you can get here, if you’d like. Exchange 2010 Service Pack 3 has been released! Microsoft just released the long-anticipated release of Service Pack 3 for Exchange 2010. Many of you have been waiting impatiently for this Service Pack as it brings you one step closer to deploying Exchange 2013! It seems that Service Pack 3 will also update the database schema of your databases. Once a database schema has been updated to SP3 you can no longer mount them on a pre-SP3 Mailbox Server. This means that you have to be particularly careful when updating Mailbox server that are part of a Database Availability Group! Along with a whole bunch of other improvements and new features, New-Migrationbatch is one of my favorite new additions to the Management Shell. While these options are still valid in Exchange Server 2013, you now also have the ability to create a migration batch using the New-MigrationBatch cmdlet. This cmdlet will allow you to submit new move requests for a batch of users between two Exchange servers, local or remote (other forest) and on-prem or in the cloud (on-boarding/off-boarding). If you have been performing migrations to Office 365, this cmdlet shouldn’t be new to you as it was already available there. To create a migration batch, you’ll need to have a CSV-file that contains the email addresses of the mailboxes you are going to move. These can be any of the email addresses that are assigned to the mailbox. There is – to my knowledge – no requirement to use the user’s primary email address. Running this cmdlet will start a local mailbox move between two Exchange server in the same forest. However, it will not automatically start moving the mailboxes as we haven’t used the –Autostart parameter. Furthermore, the moves won’t be completed automatically either because the –AutoComplete parameter wasn’t used either. Note It’s important that you specify the full path to where the csv-file is stored (e.g. C:\Files\Batch1.csv). Otherwise the cmdlet will fail because it will search for the file in the sytem32-folder by default. Please note that if you have multiple migration batches, this cmdlet will start all of them. You can query the current status of a migration on a per-mailbox basis using the Get-MigrationUserStatistics cmdlet. The cmdlet will return the current status of the mailbox being moved and the amount of items that have been synced/skipped so far. 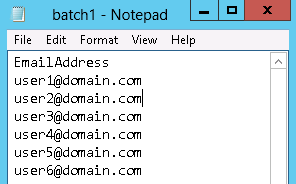 Note Alternatively, you can also use the –NotificationEmails parameter during the creation of the migration batch. This parameter will allow you to specify an admin’s email address to which a status report is automatically sent. If you don’t use this parameter, no report is created/sent. If you didn’t specify the –AutoComplete parameter while creating the migration batch, you will have to manually start the “completion phase”. This can easily be done using the Complete-MigrationBatch cmdlet. As you can see, the New-Migrationbatch will certainly prove useful (e.g. if you want to pre-stage data without performing the actual switchover). Of course, there are other use cases as well: it’s the perfect companion to use for cross-forest moves and moves to/from Office 365 as it contains numerous parameters that can be used to make your life easier. For instance the Test-MigrationEndpoint cmdlet can be used to verify if the remote host (to/from which you are migrating) is available and working correctly. This is especially useful in remote mailbox moves (cross-forest) or between on-prem/cloud. Alternatively, you could also run Get-Help Get-NewMigrationBatch –Online from the Exchange Management Shell which will take you to the same page!